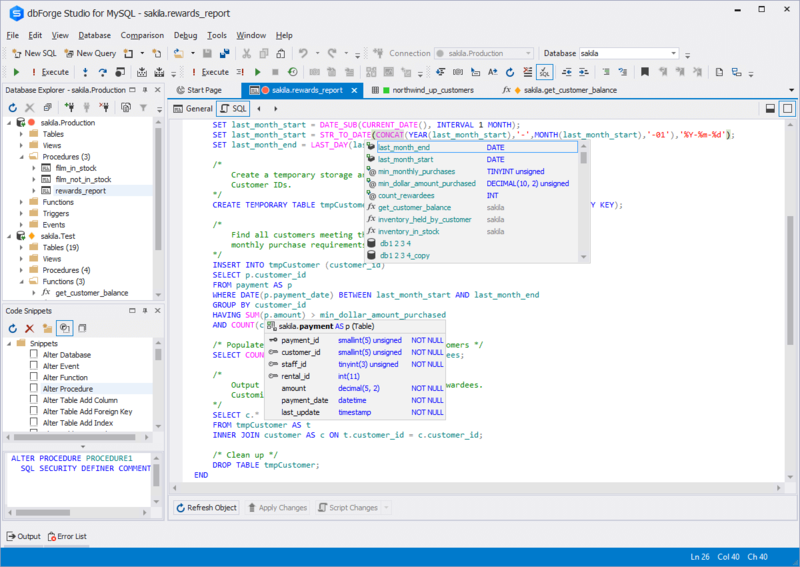 dbForge Studio for MySQL is a free MySQL and MariaDB front-end client for database management, administration and development. Devart's MySQL GUI tool provides utilities to compare, synchronize, and backup MySQL databases with scheduling, and gives possibility to analyze and report MySQL tables data. dbForge Studio for MySQL now works with any MariaDB database servers, and supports all MariaDB objects types. Everyone can visually design database structures, execute SQL queries and scripts, and manage MariaDB users and privileges. * Administration and Maintenance. Tools for MySQL database administration and management include means for managing user privileges, MySQL service control, managing server variables, table maintenance, etc. * Database Backup. Dump databases in SQL format and schedule regular MySQL database backups. * Database Refactoring. Renaming tables, columns, views, procedures, functions and indexes. Possibility to generate refactoring script of a database without changing it. * Debugger. The first debugger for MySQL that offers step-by-step code execution, breakpoints, watches, a call stack, a variables evaluation mechanism to automate debugging of MySQL stored routines and triggers and keeps MySQL server's logic of procedure execution. * Query Profiler. The tool helps you detect problems and optimize SQL queries via GUI. * Pluggable authentication is supported. The product provides the extended support of pluggable authentication modules for MySQL servers.